As an ecommerce marketer, you’re probably well aware that SEO and organic traffic can be used very effectively to grow the business. In fact, 35% of all website traffic comes from organic results and only 4% goes to PPC. And yet, many companies invest way more into PPC than SEO. SEO is an investment upfront, which is different from PPC. You can see (close to) immediate results from PPC, but SEO requires money to be invested upfront so that you can reap the rewards later. This undeniably makes it harder to invest in SEO, but the reality is that acquiring a customer through SEO is almost always cheaper than acquiring them through a paid ad if you arbitrage the costs across time. The best way to acquire targeted ecommerce customers through SEO is by ranking your category and subcategory pages higher in the search engines for their queries. Each of these is critical to get right if you’re going to rank, so let’s dive into each in depth. But before we do that, let’s talk about what you can realistically expect to rank for. SEO is a constant game of balance. You (should) always balance your user’s needs against what you are able to rank for, and throughout your site’s organization you should be merchandising what users expect to see as well as what search engines expect to see. Point blank, if you provide a better experience to your users then they will buy more, come back more often, and be much more likely to click through from search results to your website when they see your brand ranking. This is supported this study conducted in the last few years. The term has 337,000 searches per month (according to Ahrefs) and only an 18 difficulty score (supposedly), but when we look at the percentage with clicks (65%) and then what percentage go to organic (41%), we realize that this query actually *only* gets ~89,000 searches per month that go to organic. Ranking #1 for this query would bring ~18,000 visitors to your site assuming a 20% CTR. That’s great and could be highly relevant traffic, but it’s also pretty top of funnel and conversions would be a lot lower than a longer tail like “red nike mens air max shoes”. But it still might be worthwhile for branding etc. As you can see, in order to rank for this keyword you’ll need a site that is at least a DA (Domain Authority) of over 50 (and to really rank a category page, over 70 realistically) and at least 20 linking root domains to the page. 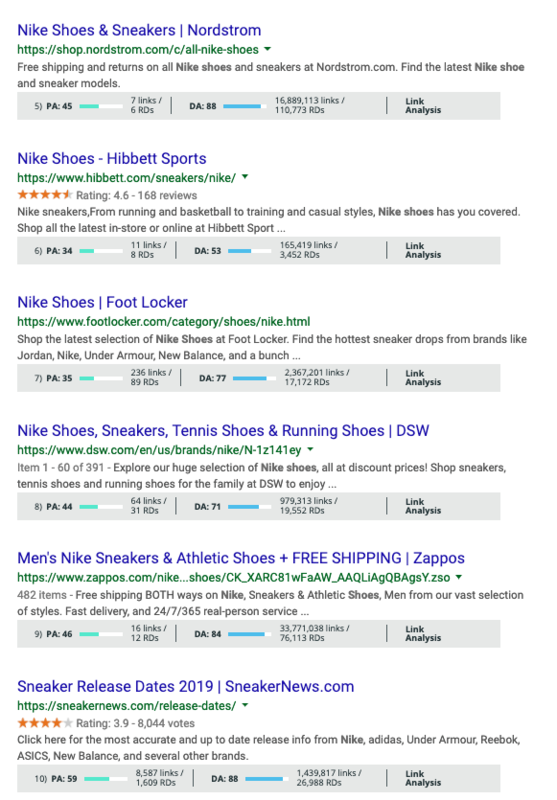 And, to be frank, you’ll never outrank Nike.com and often this SERP is full of 3-6 nike.com results before you hit a non-branded site. I’m not saying that you shouldn’t have a [nike shoes] optimized category page on your ecommerce site, but you need to have a realistic take on what it will take to rank. With that in mind, a term like [best mens sneakers] will still be competitive enough to matter but it will probably return better results for your efforts in the short to medium term as you build your brand. Alright. Hopefully now we’re settled on the framework for thinking about ranking and determining what you can/cannot rank for at all or within an amount of time. This is important because it builds strategy (so important when talking about SEO, but also so often not discussed) and informs as you do your keyword research and build your site technically, content-wise, and acquire links to your important pages. Before you start thinking about content marketing and building links, if you want to rank well for competitive head terms then you need to consider technical SEO. This would be your “men’s nike trainers” page, for example. And the above two are “men’s nike shoes” and “nike shoes” respectively. Harder for your Analytics team (maybe that’s you) to effectively slice data and know how well traffic is growing to various sections of the site. If you need to learn more about the specifics of URLs for SEO, we recommend this guide from DeepCrawl. As you build your ecommerce category pages, you need to make sure your <head> is clean and sorted out to give the search engines all the signals they need that you are a real company building a great website. To be completely honest, I think a lot of SEOs don’t focus enough on the <head> and instead just focus on what is on the page. While the elements seen by the user are absolutely important (we’re talking about them next, after all), search engines are technology and thus the better data we can provide them in the <head> the better we’ll do. Google Analytics or similar analytics platform code. Next, we get into the on-page elements for SEO. I’ve seen many instances where sites do not have proper targeting, especially sufficient (or existing) H1s and proper HTML structure, and once those changes are made the site improves dramatically. When you’re thinking about onpage optimization for SEO purposes, you first need to remember that the structure is meant first for users and secondarily for search engines. A customer is happiest when the page has one topic that it covers and then subsections that make sense underneath it, almost like a narrative. While it is possible to style <div>s and the like with CSS to achieve the same effect (in fact, that’s exactly what was happening with the site above), HTML is purposely built to enable this. So use it! <h2>s for your main subheadings, using main or secondary keyword permutations, as many as needed. Pagination with on-page links to properly send customers AND search engines deeper to find more products and navigate back to the main page. internal linking sections to similar category and subcategory pages. 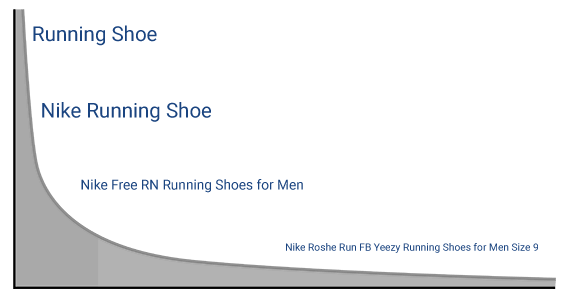 This URL should show you blue size 10 men’s nike shoes, but it is also a unique URL in its own right building off the /nike-shoes/mens/ URL. This parameter’d URL could be used as its own URL for ranking, but you probably already have URLs for blue men’s nike shoes and maybe even size 10 men’s nike shoes. In this case, there are a few ways to control these parameters so that they do not cannibalize your rankings for other terms. Canonical them back to the /nike-shoes/mens/ page so that any links these may acquire are applied to that base URL. We know from research that conversion rates improve by 7% on average per second of faster load time, but we also see that SEO rankings improve as load times decrease. Every website has a “crawl budget”, which basically dictates how often and how much a website will be crawled. This crawl budget is based off of inbound links and the popularity of the website from that perspective. 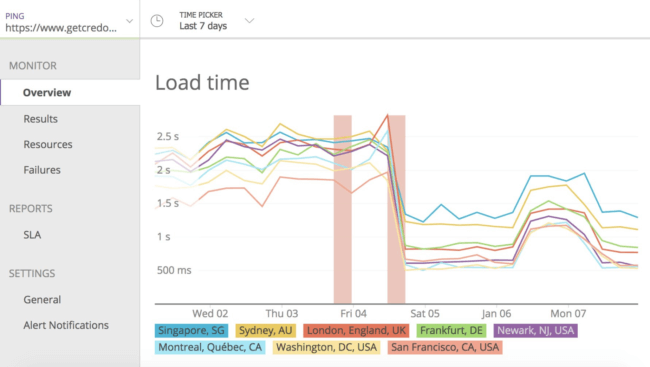 Site speed is affected by many things and is its own skillset (in the dev world it’s called “perf”), and in my experience it’s near impossible to find a developer who enjoys working on it and is good at it. That said, by following a lot of development best practices and leveraging caching using a service like Cloudflare or your host’s CDN, you can speed up your website so that your rankings and conversions improve dramatically. One of the most misunderstood concepts when it comes to SEO on ecommerce sites is the idea of information architecture and how you organize your site to make sense for both users and search engines. If your site doesn’t make sense for both, then you’re doing your site and your customers a disservice, and therefore the business. SEO can’t be done without thinking about users first! In order to rank your category (and subcategory!) pages well, they need to be accessible from the root and well-linked internally so that they can be found (easily!) by both customers and search engines. Thus, organizing your site is of paramount important. Best practice is that your main pages that you want to rank should be no more than 4 clicks from the homepage. If you have a page you are trying to rank for “men’s sneakers”, you shouldn’t hide this far down in your architecture. In this diagram, all of our categories are 1 click from the homepage and all of our subcategories are 2 clicks. The subcategories and categories are also linked via breadcrumbs from the product pages. To find how well your category pages are linked internally, I recommend running a crawl using Screaming Frog or your crawling tool of choice. I also use SEMrush (sign up for a free 14 day trial) Project to crawl my site weekly and flag up pages that may have moved down a level based on other site changes made. Using that data, you can then implement better linking to bring those pages up in the architecture again. At the top of this post I talked about determining what keywords you can rank for, but now it is time to talk about actually doing keyword research for ecommerce. I’ll be honest that I LOVE thinking about information architecture and structuring large websites so that pages can rank as well as possible without links. I’ll also be honest that I don’t really like keyword research. That said, keyword research is a linchpin of SEO and without it you’re quite simply not going to see as much growth as you otherwise could. When you’re thinking about keyword research for ecommerce, you must go further than the main head keywords. 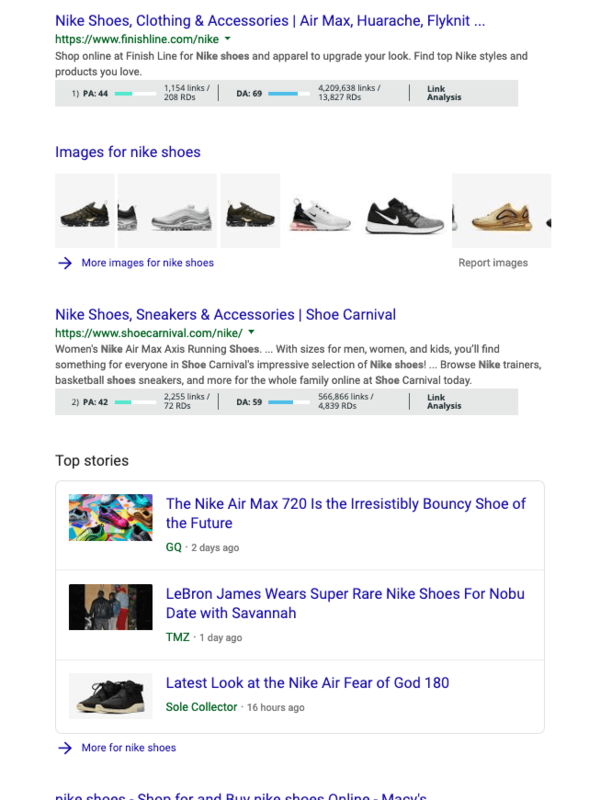 Head keywords like “nike shoes” are undeniably important, but research has shown time and time again that an outsized percentage of purchases happen from long tail instead of head terms keywords because long tail keywords are more specific and thus often further down in the purchase intent funnel. At the same time, long tail searches comprise a large percentage of all searches, especially if you believe that about 15% of queries on Google have never been seen before. The great thing about keyword research, especially for ecommerce, is that search volume (and competition, often) get less as you go more into the long tail of keywords. As you can see, it’s not a 100% relationship but on average as the keywords get longer the volume and competition go down. These longer tail keywords will be easier to rank for than a head tail keyword. Let’s talk through the framework I use for keyword research for ecommerce category pages. Now let’s talk about your ecommerce category pages and their on-page content, as this is the meat and potatoes of your pages and what ultimately affects whether or not you will be able to rank. 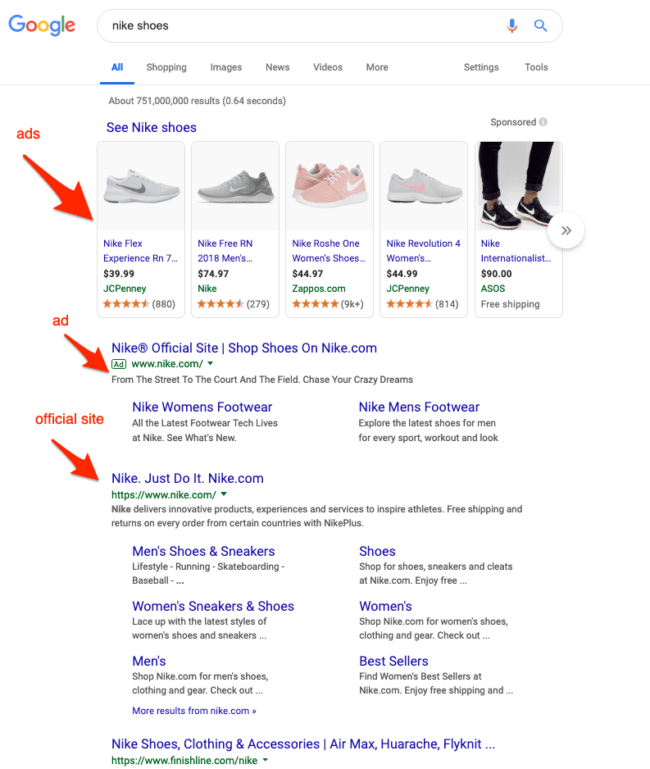 We’ve already talked about on-page SEO for ecommerce category pages earlier in this guide, but if you missed that I highly recommend going back to review it. Now let’s talk about what to put on your pages. First, after you’ve decided what your keywords are you should look at your product catalogue to make sure that you will have enough products in that category (or subcategory, as this is usually where the products numbers get smaller) to have a robust page that deserves to rank for that query. Often we get asked “how do I make this page rank for its query?”, and the answer all too often is that the page doesn’t deserve to rank from a content perspective. It is also much easier to build links to an industry-leading page (look at Brian Dean’s idea of “skyscraper content” for an example of how this can work well) than a page with relatively few products and nothing that makes it stand out. How many products are your competitors showing? How can you put unique content on your pages to help them stand out and deserve to rank more than your competitors? You need to decide how many products to show on your category pages, but it can be hard to know where to start or how many you need to show bare minimum. That’s all well and good, but how many products should you display on your category pages? To get the minimum answer, let’s look at competitors. For a moment, let’s forget about links and internal linking and brand considerations and just look at on-page content assuming all other things are equal (and recognizing that they never are). So realistically, you will need at least 12 products and more like 30+ to have a chance at competing here (and as we covered earlier, this will be very hard to compete on). When I led marketing at HotPads.com (I left there in April 2015), we actually ran some really interesting tests around number of products displayed. In our case, “products” meant “rental listings” because that’s what we were displaying. And yes, HotPads is for all intents and purposes a marketplace that deals with the same sorts of technical SEO issues as ecommerce platforms. When I started there, we were displaying 10 listings per category page. When we audited our competitors, we found that they all had minimum 20 listings and some as many as 30. So we increased the number of listings on category pages across our site to 20 and saw approximately a 10% lift in organic traffic! Then we increased to 25 and saw a further 5% lift in traffic. When we increased to 30 we didn’t see a lift at all, so we kept it at 25 for the sake of page load times. We already had a pretty strong website and were actively building links to our main category pages, but this was an easy win for us and could be for you as well. Unique data and “how to” content that the transactional searcher will also find useful. The first two are the most scalable based off your existing content, while 3 and 4 often require budget or time (or both!) investment to get it produced and on the page to help you rank. First, let’s talk about product descriptions. Third, you can add unique “guide” type content below your products to add more relevance to the page and to help your users make better decisions. This can also manifest as “how to” content, such as a guide to buying Nike Air Max based on your activity levels! Alright, you’ve made it to the end of this guide and now we’ll get down to talking about link building for ecommerce category pages. I saved this for last because link building is the hardest part of SEO, and I believe (as do many others who are much more technically inclined than I) that technical SEO is making a comeback and is actually a differentiating factor for many in 2019 and beyond. We still need links if we are going to rank competitively. So, how does one build links to ecommerce category pages? The reality is that it’s super hard, but can be possible. Remember the unique data we covered in the last section? One of the best ways to build links to these pages is to leverage that data and tell stories around it to create conversations in the press. I genuinely believe that any vertical can be made interesting with the right data and some creative story telling. At HotPads we would constantly put out things like “how much can you save by moving into a 2 bedroom apartment with your partner than by having two 1 bedroom apartments?” These stories earned us a LOT of links and brand recognition. Think about the Nike Air Max example I’ve woven throughout this article. How buying trends for Nike Air Max differ across times of year and markets (US, Australia, Europe, etc)? How much Nike purchases on Foot Locker spiked when they launched their commercial with Colin Kaepernick? I bet that second one would have earned them a TON of links if they could have been nimble enough to show that data! Sometimes you can manually build links to these hard-to-link-to pages by writing about what people can do to build their own site like yours. One of the best ways I’ve found through the years is to write a post (eg “how to build links to ecommerce category pages”) and then mention a bunch of examples through the post. Of course, you’re putting one or two of yours in here as well. The magic here can be that when you get this kind of content on a site that becomes syndicated, you can actually end up with a lot of links back to your page based off just this one article. Sometimes websites go offline for good. Businesses shut down or are sold, the pages redirect or die. While this is sad for the business owner (especially when they go out of business), it can be a gold mine for you. If a competitor of yours has gone out of business, go pull a backlink report for their top pages. Then, reach out to all of the sites linking to their now-defunct page and ask them to link to yours instead. If you don’t have competitors going out of business, sometimes you can find pages on their site that 404 and have links. In that case, even though the business is still online you can get some of their links. Another way to do the above is to recreate the content your competitor had, but to do it better. Then reach out to the linking sites and ask them to update the link to go to your content instead. Another way to build links to category pages, when they are industry-leading and deserve to rank, is by monitoring sites that mention your brand (or your competitors) and to see if you can get content on that site. If they allow linking out, then you can sometimes get a link to your pages that are most important to you. Be willing to go a few levels deep as well to link to the most relevant page for the article so that you don’t burn press contacts, and leverage the other ideas in this section for making those links count. And if you’re not monitoring your links so that you find out when a link to your site gets dropped or is redirected, then you are missing out on the easiest links you can get – those you already had! If a link gets dropped, then you can reach out and ask them to link to another place that makes more sense than their original link. Hiding dodgy links and not putting your own site at risk. We do not advise ever building dodgy links here at Credo, but we do believe in educating on how certain people do things. What I am referring to here is neither of those. We all know that the easiest way to build links is to content. If you are able to write an incredible piece of content, use your own pages on your site as examples if you can. That way, as your content gains links then those internal links (which are not as powerful as external links, but still matter!) get stronger and your page over time can rank better as well. Over to you. What have we missed through this guide about ranking ecommerce category pages for SEO? A lot of good points John. I would like to chip in my opinion on few of your recommendations. Under your “Unique Content” heading, you suggested pulling some of product features from the product listing. In most cases pulling product description/features end up cluttering the category pages, making it slow to load, hard to look at and confusing. Product description/features look better if you are displaying products in list format instead of Grid/Block format. If pulling product features is absolutely necessary then design aspects must be kept in mind to make the pages look clean and fast loading. When it comes to link building, I agree it is the most difficult aspect of SEO. 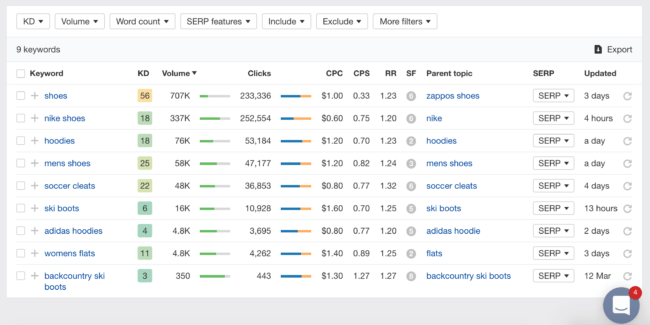 But when business is competing for keywords like Nike Shoes than they need to scale their link building campaign matching to their competitors, which makes it even more difficult and expensive. In my observation, building links from old pages and broken links is often counter productive, time consuming and can potentially raise some flags at Google, if it is absolutely necessary to do broken link building then it should be done mildly, not aggressively. As I said earlier, scaling link building for keywords like Nike Shoes is very difficult and press won’t really be interested in linking to category pages, insisting them for mentions can potentially burn the relations, but yea if there are super informative and relevant blog posts/guides on client site with links to category pages then one can secure some press mentions/links, but again it is very expensive and hard to scale. I am not saying it should not be done, but when we are competing for keywords like Nike Shoes, we need a lot of such links on regular basis, which is hard. High profile guest posting on other hand is more scale able, one can produce tightly relevant content with links to client sites on websites that are strong and highly relevant. I have seen this strategy to work best, specially when it is done in tandem with some press mentions. Guest posting is relatively easier and result oriented as it gives more control over campaign, given that there is a very smart seo pulling the strings. Wow! I was amazed of this content it straight forward and helpful. When Brian Dean tweet this page I instantly click and read and never failed to amaze me. Thanks to this I will apply this to my e-commerce website LuxxeProducts.com Cheers!